Stock market investors generally search for low-value stocks for investment. However, today I will be sharing information about high value stocks. This year performance of Sensex and Nifty is very poor. Despite of poor performance of benchmark index Sensex and Nifty, these high value stocks could able to give the return in the range of 30%-70% this year. Sounds interesting right? Market experts say that the strong fundamentals and growth in a business opportunity is the prime reason for the rise in this stock price. Furthermore, the business models of these companies are strong and these companies are expected to outperform in future. 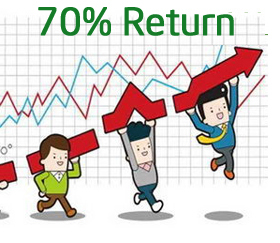 So, without wasting your time let’s take a look at High value stocks that gave 70% return in 1 year. Page Industries is a multibagger high value stock. The single stock of Page Industries is priced at 13352 Rs. You will be able to take 10 gm gold against two stocks of Page Industries. Page Industries gave 70% in last one year. Page Industries hold the exclusive license of JOCKEY International Inc. (USA) for manufacture and distribution of the JOCKEY® brand Innerwear/Leisurewear for Men and Women in India, Sri Lanka, Bangladesh, Nepal and UAE. Eicher Motors is the second high value stock that gave magnificent 55% return in one year. Eicher Motors share price is 18270 Rs. You can purchase one branded smartphone from the single share of Eicher Motors. This share has increased 14 times in last five years. If you have invested 1 Lac in this stock in 2010, your stock price will be 14 Lac today. Eicher motor is one of the respected automobile players of India. Royal Enfield bullet is flagship product of Eicher Motors. Shree Cement is the third high value stock that gave return of around 45% in one year. Single share of Shree Cement is costing 11970 Rs. The share has grown by 6 times in last 5 years. Shree Cement is Indian cement manufacturer based out at rajasthan. Growth in infrastructure and smart city project is a key factor in driving price of the share this year. MRF is famous tyre company of India. MRF is one of the high value stocks. MRF stock price is 41629 Rs. You can purchase branded Apple iphone 6 with the single stock of this company. This stock has given 30% return in last one year. This year MRF Q3 net surges 94% to Rs 447 crore. Last high value stock in the list is Bosch. Bosch stock price is 19360 Rs. 52 week high price of this stock is 27990 Rs. This stock has given 30% return in last one year. Investment done in this stock has increased by three times in last five years. Investment in high value stock is a risky affair; however magnificent return provided by these VIP stocks is the prime reason for investing in these stocks. You should invest in this stock by after doing careful research/study. Don’t forget to share these high value VIP stocks with your friends. Do you think these stocks are worth for making investment? Do share your views in comment section.